The best laid plans ... I really started to post this a, um, number of days ago. The internet seemed a bit slow, but what the heck. When I started downloading the photos, well ... after 20 minutes and only half a photo loaded I decided that this just wasn't going to happen. Then life took over, and well, yes, it's been some time, but I'm finally posting my Easter outfit. The fabric has been marinating for some time and so has the pattern. I'm happy that inspiration hit when I put these two together. A hint of vintage? The fabric is a heavier silk broadcloth with (obviously) printed polka dots in cream. Turned out to be quite the beast to cut out. "A few flaws in the printing - no problem - I'll cut around them." Famous last words. Turned out that there were so many flaws, that what appeared to be loads of fabric for this outfit, was just barely enough, and I had to incorporate a few not too obvious flaws, hoping that they wouldn't jump out at everyone. Sometimes a deal isn't really a deal. The collar and cuffs are cream silk dupioni. I think that it would have been too boring in straight polka dots. The pattern called for shoulder pads. My shoulders don't really need extra padding (except maybe to soften the bones), so I left those out, which did require an alteration to the shoulder line and therefore also the top of the sleeve. Otherwise - nothing terribly exciting in the construction. The pattern instructions were rather odd in places, so I chose to ignore them and did my own thing. One thing I did try to check was the direction to press the tucks in the front. The instructions for that particular operation made absolutely no sense whatsoever. Sometimes it just doesn't pay to waste time on deciphering these things. Back view of the skirt - cute little tab at the top of the pleat. This time I decided not to crop out my photography assistant. And now for a really bad shot, of "how it was worn", and the only reason for this is - it gives a much better idea of the actual colour of the fabric. Next dress is already sewn - just needs a press before it heads up to the closet. I promise not to lag so much before my next post! I have a love-hate relationship with jeans. They are practical. They have lots of pockets - not that I ever stash much in those pockets, but it's nice to know that they're there. Problem is, when you're bony, all those converging seams and rivets all seem to end up sitting on my hip bones. It's downright painful after a few hours of wear. Finding a pair that fits is next to impossible. My last attempt (a number of years ago) at store-bought jeans resulted in an hours-long alteration session to take in many inches at the waist. I decided to expand my pants sewing horizons - it's boring to have umpteen pairs of pants all cut from the same pattern. So - my attempt at comfortable jeans. These are from Sandra Betzina's first jeans pattern, which is now OOP, but still available. I used stretchy waleless corduroy. Not quite a velveteen. Quite a bit of altering needed to get a better fit, and - truth be told - they're not exactly what would be considered a "perfect" jeans fit. (I'm not including the derriere shot.) I don't care. They're comfortable. Any tighter and I probably wouldn't wear them. May-be I'm just not a jeans person. Topstitching is in grey - upholstery thread, just because I had plenty of it. I topstitched every single seam, and questioned my sanity while stitching on the inseam when the outer seams were already stitched up. It was like sewing in a never-ending tunnel! No, I didn't follow the lovely curvy line on the pockets for topstitching - just had to be different. Notice, too, these don't have a waistband in the back - just a yoke. I suppose that makes it easier for fitting. Oh - I had to add a fair bit in length, as I found this pattern to be quite short for my legs, and I'm not tall. Last but not least - the gory details inside. Used up the scraps from my animal print skirt from last summer for facings and pockets. 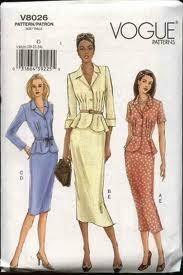 When I decide to venture into jeansland again, I think I might try another pattern. Overall, though, I do have a comfortable, wearable pair of jeans, even if they're not quite what others would consider to be well-fitting.